Audi and Nvidia have announced they are working together to bring a fully self-driving car to the consumer market by the year 2020. The announcement came on Wednesday at the Consumer Electronics Show in Las Vegas, Nevada, as the two companies outlined their vision for a fully autonomous vehicle. German automaker Audi hopes to be one of the first automakers to achieve the feat, and is banking on U.S. graphics chipmaker Nvidia's artificial intelligence car computing platform, which uses deep learning to negotiate complex real-road conditions. Audi's Q7 Piloted Driving Concept. "Nvidia is pioneering the use of deep learning AI to revolutionize transportation," Nvidia CEO Jen-Hsun Huang said. "Audi's adoption of our Drive computing platform will accelerate the introduction of next-generation automated vehicles, moving us closer to a future of greater driving safety and new mobility services." 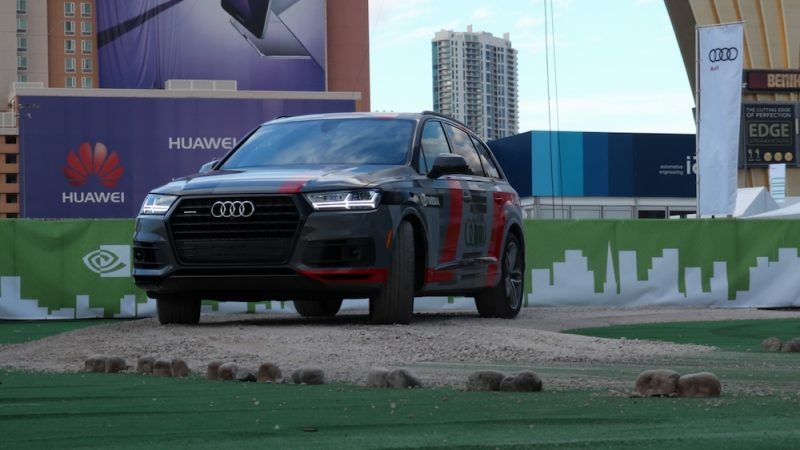 To offer a taste of the results of their collaboration, Audi has been demoing its Q7 Piloted Driving Concept, which is fitted with Nvidia's Drive PX 2 processor. The companies claim that after four days of "training", equipped vehicles are able to drive themselves over a complex road course, thanks to the PX 2 chip's ability to learn on the fly without recourse to pre-mapped routes. Audi and Nvidia have been working together for almost a decade, but the announcement at this year's CES is an indication of just how far the collaboration has come. Originally the partnership was limited to using Nvidia's graphics processors in Audi's virtual cockpit and navigation systems, but ambitions have since grown, and Audi said it will begin expanding its testing of the highly automated, artificial intelligence-equipped vehicles on public roads in California and select states in 2018. For Nvidia's part, the traditionally GPU-focused company has been working on autonomous vehicle systems for several years now and has rolled out development platforms and agreed partnerships with over 80 automakers and suppliers to realize its self-driving goals. In September the company introduced Xavier, a complete AI system on a chip for self-driving cars that's designed to meet international functional safety standards for in-car electronics. Apple is thought to have refocused its car project recently. The company has shelved plans to build an electric car for now, and is instead working to build a self-driving software platform for use in vehicles made by established automakers. In December of last year, Apple confirmed its interest in the autonomous car market, in a letter to federal regulators urging them to ensure fair competition and equal rights for "new entrants" in the industry. Didn't realise Nvidia was a player in this market, let alone a leader. How on earth did they get an edge over Apple with all the cash, talent and other resources it has behind it? Yep - says a lot about Apple, doesn't it? Too much focus on damned watches, thinness and trying to be "cool" etc. Well, it would be one thing IF Apple was actually focused on watches... or any of it's products. But it's really just farting out ordinary product these days and spraying with flowery descriptions to cover up the stink. AirPods might be the lone exception of late - a truly neat and buzz worthy product. (Yes, not without faults, but even great products are not perfect first gen). Nvidia can. Apple can't. The cool is evaporating faster. "New entrants," also known as the company whose Maps app *still* thinks my closest emergency room is a museum (a colonial psychiatric hospital—first in the US) in spite of years of submitting user reports to have them update this info. Also known as the phone company whose software updates have rendered iPhone users unable to make phone calls on a *phone* and have to connect to iTunes. I can see it now, someone bringing an old laptop out to the driveway to connect the car to iTunes via Lightning, Dock Connector, or the port du jour, to restore the car after a bad software update. I have loved Apple. I still want to love Apple and hope they turn around. I do not trust Apple when it comes to something as serious as a car. That's how automakers work. They rely on suppliers that develop the tech they need anonymously - and serve them as customers, not the end customer. Apple would probably not be humble enough or controllable enough for an automaker to allow itself to depend on them as a single-source. It will help gridlock, and the stop / start traffic which is caused by humans over breaking ( for example ). Also, safer streets. Lets face it, humans drivers are generally poor. Self driving cars are definitely the future. If companies can offer them, why shouldn't governments support their initiatives? Enough already with the full autonomous, self driving cars. The majority don't want them, but yet for some reason someone or some (governmental) entity seems intent on ramming them down our throat. Hopefully the new administration in Washington puts the brakes on this. The article states Nividia and Audi have been working together for almost a decade. Wasn't aware of that. This will be one grandiose of a luxury autonomous vehicle if and when it releases. From keynote : " 10:50PM EST ('http://www.anandtech.com/show/10999/ces-2017-nvidia-keynote-live-blog#post0104225007') - 'Let's make sure none of our kids ever have to learn to drive' "
Excuse me? You wanna say this is the direction they wanna take humanity in? I'd rather not thank you. Tesla's Autopilot in its current state is about as far as it should go. Driver assisting, not driver replacing.